Monte Haxton and his family moved to Claflin when he was in fourth grade. Haxton became great friends with a fellow student named Doug Oberle. The pair graduated in the same high school class and they were college roommates for two years. Oberle eventually married Haxton’s sister, Gina. Oberle spent some time in broadcast journalism and then in the army before he has served on the Victoria football staff for the last 12 years, including the past nine as head coach. Haxton has coached at several places, namely Mulvane and Chaparral, and is in his first season as an assistant football coach for Argonia-Attica. The two talk often, including throughout this fall. During Week 9, the Oberle and Haxton families spent a lot of time together in Claflin when Gina and Monte’s father passed away. On Saturday, the longtime friends and in-laws will match up in the Eight-Man, Division II state championship game at Newton’s Fischer Field. No. 1 ranked Victoria is 11-1 with 11 straight victories and is playing in the state finale for the seventh time in school annals, the first since 2008. The Knights have three 11-man crowns and eight-man titles in 2004 and ’06 before a second-place finish to Hanover in ’08. “Going through the year, he was calling him and talking about the scores and everything and joking about, 'Well, I guess the only way we will be able to play each other is if we make it to the state championship,’” Argonia-Attica co-head coach Luke Greenwood said. “Sure enough, here we are, and here they are playing. I know they keep in constant contact, have been in contact this week. It's kind of a unique situation." Argonia-Attica is in its second year in a football-only co-operative agreement, has a seven-win improvement from 2013 and stands 12-0 with the No. 2 ranking. In addition to the coaching similarity, both squads have significantly improved throughout the season, and both feature an all-state caliber quarterback to highlight multiple offensive weapons. Argonia-Attica has tallied 751 points, nine off the eight-man state record of 760 set by Osborne last season. The Titans will try to join last fall's Osborne squad as the only eight-man teams since 2000 to miss the playoffs one year and then win a state title the next. Longtime Attica coach Lance Vandeveer is the co-head coach and runs the defense. Greenwood, the veteran Argonia coach, has the offense. The Titans trailed Cedar Vale-Dexter by three scores in Week 2, rallied back to win 28-26. They picked up a 90-52 non-conference win against Pratt-Skyline in Week 4, and won 60-38 in a key road district contest versus Caldwell in Week 5. “To be here and talking about being undefeated and having a chance to play for the state championship, it's a welcome surprise,” Greenwood said. “When we went together, we saw the districts, how the districts lined up and how our schedule came out last year, we thought we had a great chance at being competitive and making the playoffs and things just kind of came together, and we got hot at the right time." Junior Alec McDaniel is the team leader on both sides of the ball; Greenwood said the 5-foot-7, 130-pound McDaniel “has a football mind” and “can make something out of nothing” in the team’s pistol offense. He has completed 79 of 123 passes for 1,577 yards with 32 scores against four interceptions for the Titans. He has rushed 207 times for 1,540 yards and 35 scores and leads the team with 161 tackles. Oberle has been impressed with McDaniel’s vision, ability to keep plays alive and pitch to the running back five, six yards downfield to yield big gains. The team has six seniors: ends Andrew Mages and Jerry Swart, linemen Raydan Nemechek and Austin Tracy and wingbacks Doss Grigsby and running back Garrett Wells. Victoria, with two seniors, Bryan Dome and Noah Dreiling, returned most of its core from an injury-plagued 10-1 year in 2013. At the summer Fort Hays State team camp, Oberle believed he had a strong squad if the Knights could get out of a district with Beloit St. John’s-Tipton and Thunder Ridge. The squad has enjoyed great depth and had few injuries, especially on the line with juniors Eric McAlonan, Wheaton Hockersmith and Brandon Brungardt. Junior quarterback Brady Dinkel has completed 48 of 94 passes for 989 yards with 19 scores and rushed 111 times for 938 yards for 16 touchdowns. Dome, whom Oberle calls the team’s vocal leader and catalyst, has delivered multiple big plays at key times. He has three kick return touchdowns, part of nine defensive/special teams scores for the Knights. Dome clinched a Week 4 win in the final seconds against Ness City with an interception, and has switched positions twice. At the start of the year, Dome moved from defensive back to linebacker. Then, junior fullback Lane Kisner was injured in the first round of the playoffs with a leg issue (Kisner might play Saturday). Dome switched from tailback to fullback. “It seems like when we need something, he is there,” Oberle said. While A&A’s offense has made headlines all year, Victoria’s defense – which comparing schedules has been nearly as dominant. The Knights have allowed just 172 points or 15.6 points per game. Their opponents, in all other games, tallied 43.6 points per contest, a difference of 28 points. A&A’s offense has averaged 62.6 points per game. In all other games, its opponents allowed 29.5 points per contest, a difference of 33.1 points. Victoria’s offense tallied 46.3 points per contest, a plus-23.7 differential from their opponents in all other games. A&A’s defense permitted 25.5 points per contest, a differential of 8.3 points from opponents in other games. 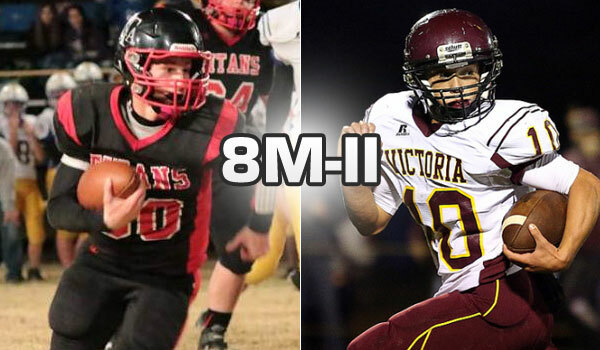 Last week, Victoria delivered an outstanding defensive effort in a 28-12 victory against Wallace County. “The thing that has come around and we were able to see Friday was the growth and maturation of our defensive line in terms of getting after the quarterback,” Oberle said. The Titans used their high-powered offense to roll over Axtell, 70-44.